It was just this past July when “The call” came that afternoon. My father was the one to tell me that my last living grandparent had passed in a fashion that left everyone in a fit of laughter instead of tears. She had insisted on passing at home, in her bed, alone but her daughters refused to leave her side. She got her wish. The power went out in her home sending all three of her daughters scurrying to the basement in search of the electrical panel. She was at home, in her bed, alone when she passed from her to eternity just like she wanted. She was my Paternal Grandmother. 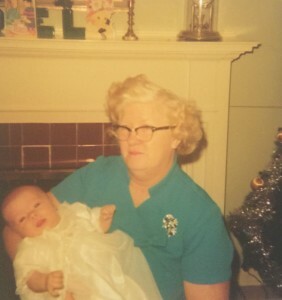 She was 91, loving wife to my grandfather who passed years earlier, mother to three boys, and three girls, grandmother to thirteen and great-grandfather to 10. Without a doubt, she lived a full life, and her smile lit up a room when surrounded by family and she always had a story to share when I called. When I heard the news, I wasn’t surprised. . Her health was declining, and we knew she was lonely after her groom of 61-plus years left her side. According to my father she was actually quite upset one morning to find herself alive and not with my grandfather. But still, the finality of losing all of my grandparents is slowly starting to sinks in. Even thought we lived provinces away and we only shared a handful of visits with her and Grandpa I miss her. I miss her laugh and the way she said my name. I’m the baby she is snuggling in this photograph taken the day I was baptized (which I have learned is the same church my parents were married in too!) She raised a family and lived in that house until the day she passed away. How crazy is that?!? How blessed and lucky I’ve been to experience the love of grandparents for so many years. How wonderful it has been to watch my own kids play cards with their great grandparents. To hug them, kiss them, listen to their tales. What a treasure they’ve been given to witness the love of a family that has endured for so many years. I have pictures of four generations – and that is a rare thing these days. Family, as I’ve learned, is everything. It’s showing up. It’s compromising. It’s sacrificing. It’s love. With the juggle of four kids and two careers plus school we lean heavy sometimes on those extra set of people to shuttle our kids to activities. To watch them while we attend weekend classes or sneak in a “date night”. Holiday’s and birthdays are much easier as well. My children have such a special relationship with their own Paternal grandparents today. They often have the biggest group of cheerleaders at school concerts and piano recitals. My father in law occasionally drives my kids to school when I am scrambling to deal with a sick child. We are able to enjoy spontaneous weekend dinners. Or meet up for burgers. They can ride their bikes to nanny and Gua’s for a quick hello or sneak over after we drop the other two off at school for “second breakfast”. My kids can shoot BB guns with their grandpa in the backyard. They enjoy special pancake breakfasts after Saturday sleepover. They relish the cuddles of being read to on the couch and are often treated to secret McDonald’s visits and baked treats – when mom and dad aren’t looking. They converse about topics only grandparents and grandkids can enjoy, and they experience the love of family members who sometimes have more patience to give when two busy parents are simply trying to juggle it all. My kids are loved like crazy by their grandparents – and that will never be a bad thing. I credit all of my grandparents for creating a family that truly values “family.” I will forever be grateful for the lessons I learned from them and the joys they gave me, especially in my childhood days. I will fondly remember baking, competitive games of Spite and Malice, playing with costume jewelry, delighting in pudding pops, watching “Another World” and “The Price is Right”. I will remember the smells of Thanksgiving feasts, the trips to pick Saskatoon berries, the dressed up excursions to attend Christmas mass and the jello salad I did not want to eat. Today, I can’t help but reminisce about the grandparents I lost, but I am so thankful for the memories I gained. I am so very thankful for Grandparents. They gave me family, and now I want nothing more than to give my own children those same amazing gifts. She may have been the last but, family we will always be. Here’s to you Toots… until we meet again. What a wonderful family you have and I admire your grandmother for doing it her way. We should all treasure our families every minute of every day. I no longer have grandparents but I’m very much thankful for all that they’ve done for me to shape me to be the woman that I am today. Exactly! Sometimes I wish I could go back in time and see what they were like at my age. At least we have those memories! Love the story of how your grandma passed although I am very sorry for your loss, it is great that she passed in her own way on her own terms. This is a great thing to be thankful for. 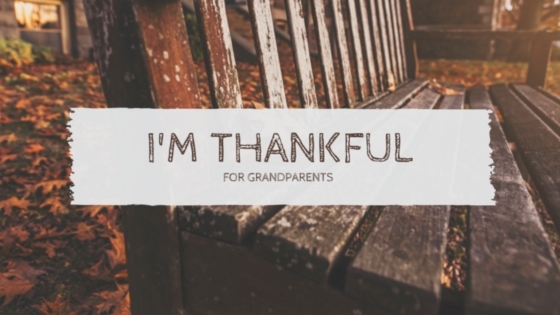 I miss all of my grandparents so much and I am thankful that my kids have a great relationship with their grandparents! This is so touching and has me reflecting on the ones I love who have passed on. Many blessings to you. This is so sweet. Your grandparents sounded like great people. I wish I had a few photos of my grandparents. All I can say is wow! Your post stirred many emotions in me. I have 1 remaining grandparent and I dread the day I lose her. Thank God for memories as you so eloquently stated. My last living grandparent passed away last year. She was 100. Man, I miss them all so much. My kids have six grandparents right now and I think so hard about how lucky they are. May they all have decades yet. I never knew my grandparents so I make it a point for my children to really get to know theirs. Great tribute! I only have one grandparent left, but when the others were still alive, they were very active in my life. I just wish my grandfathers had been alive to meet my boys. What a beautiful post and a lovely tribute to your grandparents and, especially, your grandmother. She sounds like she was a very special person.